1. Prepare the pizza dough from the above recipe or any of your choice and allow it to rise. Meanwhile, prepare the filling. Take oil in a shallow pan, crackle cumin and fennel seeds. Add onions and capsicum. Sauté well. 2. Now add red chilli powder, turmeric powder, coriander powder, salt and garam masala. Mix well. Add the ketchup. Mix again. Now add mashed potatoes and peas. Gently bring all ingredients together. Add coriander and mix well. Set aside the filling to cool. 3. Divide the dough into 4 portions. Place the balls on a lightly floured surface. Slightly flatten them into a disc and allow it a rest for 5-10 minutes. Roll out into a circle of desired crust thickness. I prefer thin crusts so I rolled out the dough balls thin, but make sure it is not too thin or the dough will crack up during rising. Place a large scoop of filling on the rolled discs and gently fold up the sides bringing them on top of each other. Press the ends together and quickly flip the prepared ball tucking the closed ends underneath. Place the flipped buns on a lightly greased baking sheet and allow to rise for 30-40 minutes. 4. Pre-heat oven to 220°C. 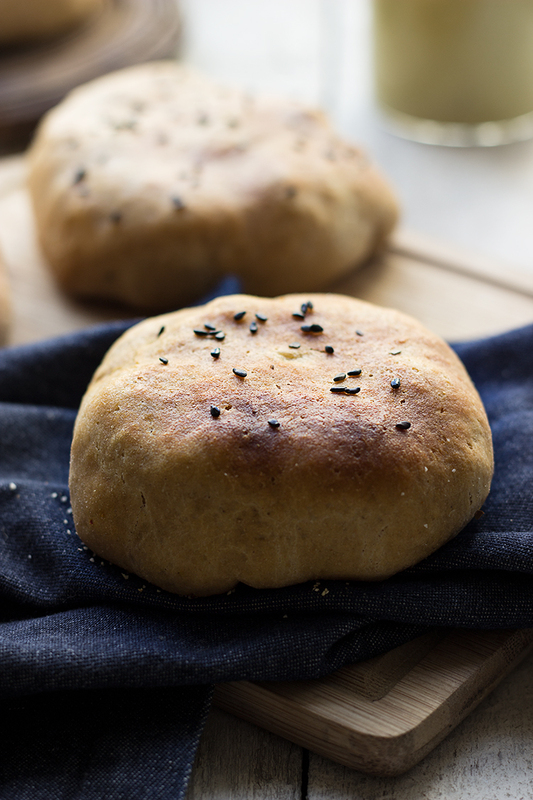 Bake the masala buns for 15-20 minutes or till nice deep brown on top. Serve hot. Masala recipe adapted from here. You can make any filling recipe of your choice. My friend made mushroom, spinach and cheese filling for her buns. Since I don’t eat mushroom, I stuck to potato recipe. The crust thickness is a matter of choice as well.